Good morning (or afternoon for you probably)! Are you ready for Christmas yet? I am not, so that's why I'm late in posting. Lisa from All That and a Box of Rocks tagged me for this Christmas meme and since it's different than the one I did previously, it's the perfect easy post for a Monday! Yes - if I hadn't by now that would be a little scary! I do have a few more things to take care of this week though. We do always like to drive around and look at the Christmas lights. This year, we're going to do that on Christmas Eve - I'm looking forward to it! 3. Are you a Black Friday Shopper? Um...in December...before Christmas. We did manage to get the tree up a couple weeks before Christmas this time, but the decorating of it still isn't finished - LOL!! We stay home and have a fairly quiet Christmas which I enjoy. We usually have 2 of the brothers-in-law over on Christmas day. A couple of years ago, my son and I made my hubs go searching around the house following clues to find his big gift. We put little gift boxes in each spot that he had to open only to discover notes from my son like, " Oh BUMMER, this is still not your gift! Guess you better go look in the bedroom." We put 1 of the clues waaayy under son's bed, so hubs had to lay down and scoot under to get it. Oh so very amusing to watch!! Don't worry - he got a good gift to make up for it! We all had a good laugh! Well I really love It's a Wonderful Life! That's all I've been doing the last few days!! 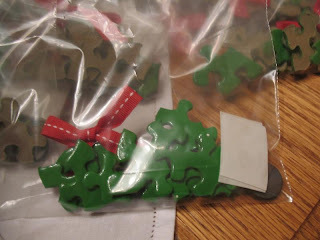 Things like Dried Cranberry Biscotti, Christmas Mocha Balls, Vanilla Party Mix, Rich Chocolate Chip Toffee Bars, and a couple recipes from blog friends: Chocolate Raspberry Crumb Bars from Frugal Creativity and Lace Cookies from Knit1Kids4. I love real trees, but after a few years of spending a fortune on trees that ended up crispy and ugly by Christmas (no matter what tricks we tried), we decided to go with a fake tree. I miss the smell, but don't miss the needles everywhere! My panic is always the night before my son's last day of school and Christmas party! 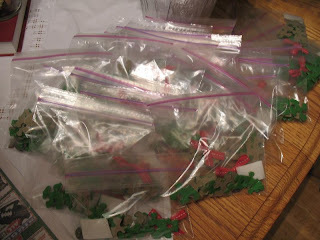 I am always trying to put together all the homemade teacher gifts and goodies for son to give to classmates. Hubs' office party is usually around the same time so I have the coworker gifts and dessert for the party to get ready. After that, nothing seems as stressful even if I don't have it all done in time! Yes, we usually still have a couple things to finish wrapping that evening, but not much (we don't give each other a lot of presents so there's not too much to wrap). Seeing lights, making & eating goodies, and just enjoying son's time off from school! My wreath is on the left; son's on the right! 14.Christmas music. Yes or No? If yes what is your favorite song? I love Christmas music! My absolute favorite song is Oh Holy Night. I love all the hymns, music from The Nutcracker, and also like songs like White Christmas and Rockin' Around The Christmas Tree! In the next day or 2. I want to be all done before I have my lovely filling/possible root canal on Wednesday! That's it! I'm not going to officially tag anybody, but if you want to play along - go right ahead! But do come back and let me know so I can come see your answers! I hope you are all having a wonderful week and not stressing too much! Merry Christmas! 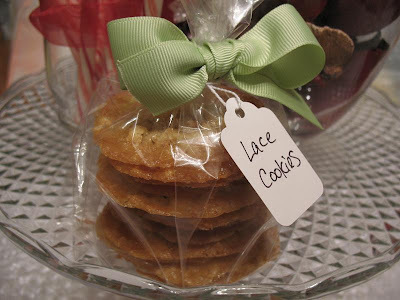 Oh my goodness - my Lace Cookies look so good dressed up for the holidays! And now I'm thinking I need to use your idea of hiding one of my husband's gifts. Oh that would be so much fun! Hey, I grabbed your other Christmas meme and posted it today. Oh I loved this post my friend. And really enjoyed the thing you made your hubby do to find his gift. That's a great idea. 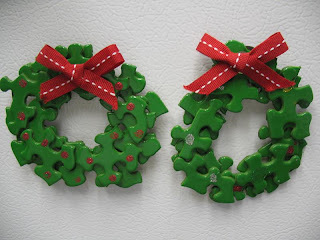 Your wreath crafts turned out really nice. I'm glad you all had fun making them. I received a nice little surprise today. You are just too much. You do spoil me my friend. I hope you know how much I appreciate your thoughtfulness. 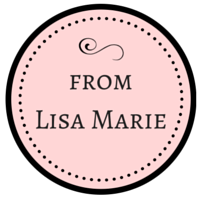 Big you need to go read my post now because it involves you size hugs! Your son sounds like a funny kid!! What a great meme Lisa. 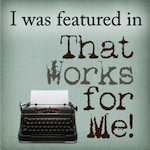 I am stealing a few moments to pop on and take a peek at some of my favorite blogs. Been busy with my son in town, having fun, but missing my "blog family", LOL. Look at YOU! 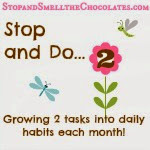 What a fun post - I had to jump in on the fun and posted my responses at Mommies Coffee Break!